If you are not a citizen of Canand or USA or a permanent resident of Canada, you might need a prior Electronic Travel Authorization. Therefore, if you are going to fly to or transit through a Canadian airport, then this can be done by paying CAD 7 as fees. add, renew or change a frequent flyer number. To the U.S. From Toronto Pearson You should arrive at the airport three (3) hours before scheduled departure time. Pre-board security screening for departures to the U.S. begins 3:00 AM. The web check in begins 24 hours before the departure of flights. Passengers shall complete check-in and leave their baggage at drop-off counters at least 45 minutes before departure of flights within Canada and 60 minutes before flights between Canada and other countries. It is permissible on Air Canada and Air Canada Express (operated only by Jazz). You are allowed to print the boarding pass using web check in facility. Web check in allows 9 passengers to check-in in one session. 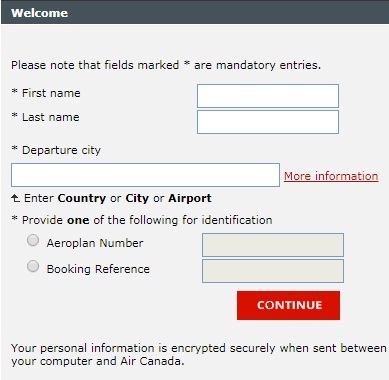 Online check in is available from all airports in Canada. However, it is available only from some cities around the world. Mobile check in is also available to the passengers. This can be done by visiting mobile.aircanada.com from your mobile device. Alternatively, you can download the Air Canada mobile application at: Apple iTunes, Blackberry App World and Google Play. All facilities which are available in web check in are also available in mobile check in. Only 4 people can check in using mobile at one time (in one session). This facility is available for passengers flying on Air Canada and Air Canada Express. Mobile check-in opens 24 hours before scheduled departure of flights. Passengers shall complete check in and drop off their baggage at least 45 minutes before domestic flights of Air Canada and at least 60 minutes before international flights of Air Canada between Canada and other destinations. Kiosks at the airports can also be used for checking in so that there is no need for standing in long queues at the check in counters. Self service kiosk check in can begin 12 hours prior to scheduled departure of flights and closes 45 and 60 minutes before scheduled flight for the flights within Canada and to other destinations respectively. It shall be remembered that the check in at Toronto airport will close 20 minutes before scheduled departure for flights within Canada, and not 45 minutes. This is an exception to the general rule. If you are carrying checked in luggage and it has to be dropped of at the Bag drop counter at least 4 hours and 3 hours prior to scheduled departure of flights from Canada/US and other locations respectively. Travellers can leave their baggage at drop-off boxed beginnning 4 hrs prior to scheduled departure of flights from Canada or USA, and 3 hrs before scheduled time from other locations. Travellers would need to drop-off their baggage at drop-off counters at least 45 minutes before departure time of flights within Canada or 60 minutes before departure between Canada and other countries. For flights within Canada and to/from US, boarding gate closes 20 minutes before scheduled departure. For other international flights including Mexico and Caribbean, closure time is 30 minutes. For Caracas in Venezuela and Tel-Aviv in Israel, the closure time is 60 minutes before departure. When you are flying on other connecting flights as well, then there are certain minimum time limits which shall be maintained for ease of checking in. These minimum times are given by Air Canada for different interconnecting airports/cities. Know these minimum connections times before you book connecting flights. This is done on website of the airline using its online check in facility.